For those using Apple iPhone 4S who want more protection just in case you drop the shiny smartphone, OtterBox has recently confirmed it will offer all four of its case lines for the iOS device, providing protection for any lifestyle. Defender Series, Reflex Series, Commuter Series and Impact Series will be coming in a variety of fall and winter colors. "We're excited to offer our entire product lineup for the latest iPhone," said OtterBox Founder and CEO Curt Richardson. "The earliest adopters of Apple's newest phone will have the OtterBox protection they crave." 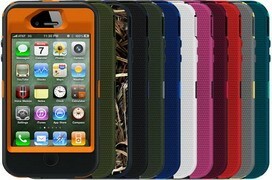 For more information about the latest protective solutions from OtterBox, visit www.otterbox.com. 0 comments on "OtterBox Cases for Apple iPhone 4S"